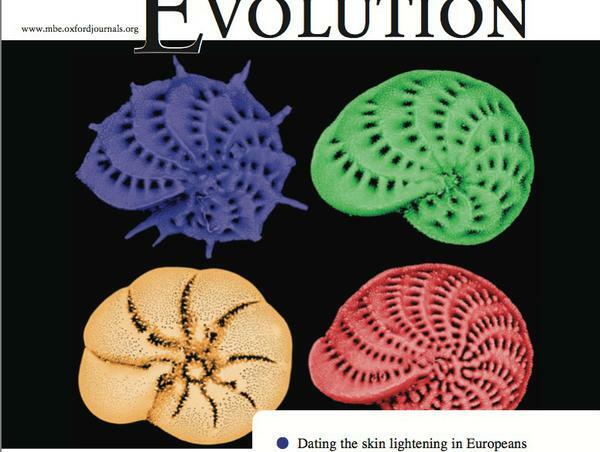 The January 2013 issue of Molecular Biology and Evolution will publish a cover story by Prof. Pawlowski's laboratory on Elphidium. Elphidium is a foraminiferal genus, which members feed on diatom algae and selectively retain their chloroplasts, while digesting the rest of the algal cell. During that process, known as kleptoplastidy, the acquired plastids remain active inside the foraminifera for several months. As most of the genes required to sustain the activity of the chloroplasts are encoded in the diatom nucleus, it is unknown how the host cell can maintain the photosynthetic activity without this information. It has been proposed that Horizontal Gene Transfer (HGT) from the prey to the host nuclei could explain the maintenance of kleptoplastids. To test this hypothesis Loïc Pillet of the Pawlowski lab obtained 17,125 EST sequences of Elphidium margaritaceum and screened this data set for diatom nuclear-encoded proteins having a function in photosynthetic activity or plastid maintenance. These analyses show no evidence for the presence of such transcriptionally active genes and suggest that HGT hypothesis alone cannot explain the chloroplast's longevity in Elphidium.